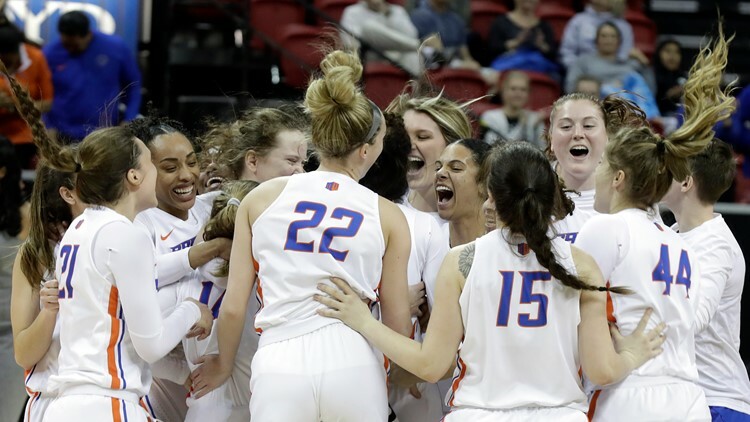 Boise State players celebrate after defeating Wyoming 68-51 in the Mountain West women's tournament championship Wednesday, March 13, 2019, in Las Vegas. All the Boise State women’s basketball team wanted was a neutral court in the NCAA Tournament—a level playing field. Now it has no choice but to play with its hair on fire. BOISE, Idaho — Friday, March 22, 2019. Boise State has never won an NCAA Tournament game in women’s basketball (not to mention men’s hoops). Tomorrow’s date with Oregon State in Corvallis may not be the place to expect a victory, as the website 5dimes.eu has the Beavers as a 15½-point favorite. But that’s why they play the games, right? Riley Lupfer will have had 10 more days of rest for her ailing back. If she’s 100 percent again, that’ll take a little offensive pressure off Braydey Hodgins and Marta Hermida. And there’s the “chip-on-the-shoulder” factor, the No. 13 seed handed out by the NCAA selection committee for a team with an RPI of 39. The Broncos will be taking the court just after Little Rock, with an RPI of 61, plays Gonzaga as a 12 seed. OSU is hosting the first two rounds for a reason, though, not the least of which is you-know-who. Let’s talk a little bit about Destiny Slocum. The Mountain View High grad and two-time Idaho Gatorade Player of the Year was starring as a true freshman at Maryland two seasons ago. Slocum won WBCA National Freshman of the Year honors after a campaign punctuated by a highlight-reel 70-foot basket in the second round of the NCAA Tournament. But Slocum wasn’t comfortable in the East and returned West, transferring to Oregon State. She disappeared last year when she had to redshirt, but man was that short-lived. As a sophomore this season, Slocum was named All-Pac 12 after leading OSU with averages of 16.0 points and 4.6 assists. She twice bypassed Boise State, but she has struck a note for women’s hoops in the state of Idaho. Nevada’s run to the Sweet 16 last year was all about comebacks, rallying from 14 points down to top Texas in overtime and from 22 back to beat Cincinnati. Heck, the Wolf Pack trailed Boise State by 15 in the first half just last week. In the first round of this year’s NCAA Tournament, the seventh-seeded Pack trailed Florida by 18 points in the second half, but despite a valiant comeback that got the Gator lead down to two, it didn’t have enough in the tank and lost 70-61. A Nevada team that was once No. 6 in the country went into March Madness at No. 20 and may ultimately be known as the second-best team in the Mountain West this season. Now, what kind of Mountain West flag-carrying can Utah State do when it faces Washington late this afternoon in Columbus? The Aggies are one of the hottest teams coming into the NCAA Tournament, having won 17 of their last 18 games. If the season had lasted another week, they’d be in the Top 25 now. USU is not a one-trick pony, riding MW Player of the Year Sam Merrill on the outside and beastly freshman Neemias Queto on the inside. The Huskies are not nearly as well-rounded, losing three of their last seven games despite winning the Pac-12 regular season title. Two of the defeats were to Oregon, including one in the conference championship game, and the other one was inexplicable: a 76-73 loss to a Cal squad that ended up 8-23. Utah State needs to win this game. Borah High grad Rylan Bergersen is looking for something new, leaving BYU after two years with the Cougars. Bergersen, son of former Boise State great Roberto Bergersen, is a 6-6 guard who played in 50 games for BYU but scored only 1.9 points per game, averaging 5.8 minutes. It would be storybook if Bergersen could be a Bronco like his dad, but there’s currently a logjam at his position at Boise State. He’ll attract plenty of suitors, though. Bergersen has a redshirt year that he’ll have to use next season—then he’ll have two years of eligibility remaining. There are already five former Boise State standouts on the Dallas Cowboys roster—Leighton Vander Esch, DeMarcus Lawrence, Tyrone Crawford, Darian Thompson and Cedrick Wilson. And that’s not counting offensive coordinator Kellen Moore. Could there be a sixth in the form of George Iloka? NFL Network’s Ian Rapoport reports that the Cowboys will be hosting the free agent free safety for a visit today. Iloka spent his first six seasons with Cincinnati after being drafted by the Bengals in the fifth round in 2012. Cincy cut him last summer, and he landed with Minnesota, where he made only 16 tackles last season. Iloka turns 29 a week from Sunday. CARRYOVER FROM FLORIDA TO SOUTH DAKOTA? The Idaho Steelheads experienced one big valley and two big peaks on their trip to Orlando that wraped up earlier this week. The Steelheads try to build on the latter when they visit the Rapid City Rush tonight and Saturday night. After a 6-2 loss to open the series last week, the Steelies delivered 4-1 and 7-2 thumpings of the Solar Bears. Idaho could logically keep it going, as it is 9-1-2 this season against Rapid City and has won 20 of its last 25 games versus the Rush. Forward Steve McParland, who’s probably between AHL call-ups, continues to lead the Steelheads in scoring. McParland connected for a pair of power play goals last weekend and is tied for second on the team in that category. The 13th-ranked Boise State women’s gymnastics team goes for a fifth-straight Mountain Rim Gymnastics Conference Championship, hosted tonight by 15th-ranked BYU. The Broncos will be trying to overtake the Cougars, who beat them in Taco Bell Arena two weeks ago. Boise State’s Abbey Sorensen is at the NCAA Swimming Championships for the third time in her career. Sorenson, the Mountain West champion in the 200-yard backstroke, swims the prelims in that event Saturday morning in Austin, TX. And the Bronco women’s softball team, sporting a 21-4 record and a top 20 RPI, finally plays its home opener today at Dona Larsen Park when it begins a three-game series against San Diego State. In Canyon County, the College of Idaho baseball team has a four-game weekend series against the University of British Columbia beginning today at Wolfe Field. The Coyotes are 13-18 overall and 7-5 in NAIA West play. And Northwest Nazarene men’s basketball will have to forge ahead without Adonis Arms. The GNAC Player of the Year told the Idaho Press he intends to transfer to a yet unnamed Division I school “because I have a dream I am pursuing.” Arms came to NNU from Mesa Community College and led the conference in scoring this season with 20.6 points per game. One of the most bizarre endings of any of Boise’s NCAA Tournament games, as Missouri overcomes Marquette in the second round, 83-79. The game was tied 79-79 when Mizzou’s J.T. Tiller went down on a hard foul with 5½ seconds left. True freshman Kim English came on to make both free throws in place of the injured Tiller. Then the Golden Eagles’ Lazar Hayward stepped over the baseline on the ensuing inbounds play to give the ball back to the Tigers and seal the deal. The Taco Bell Arena crowd booed lustily when Tiller re-entered the game one second later.